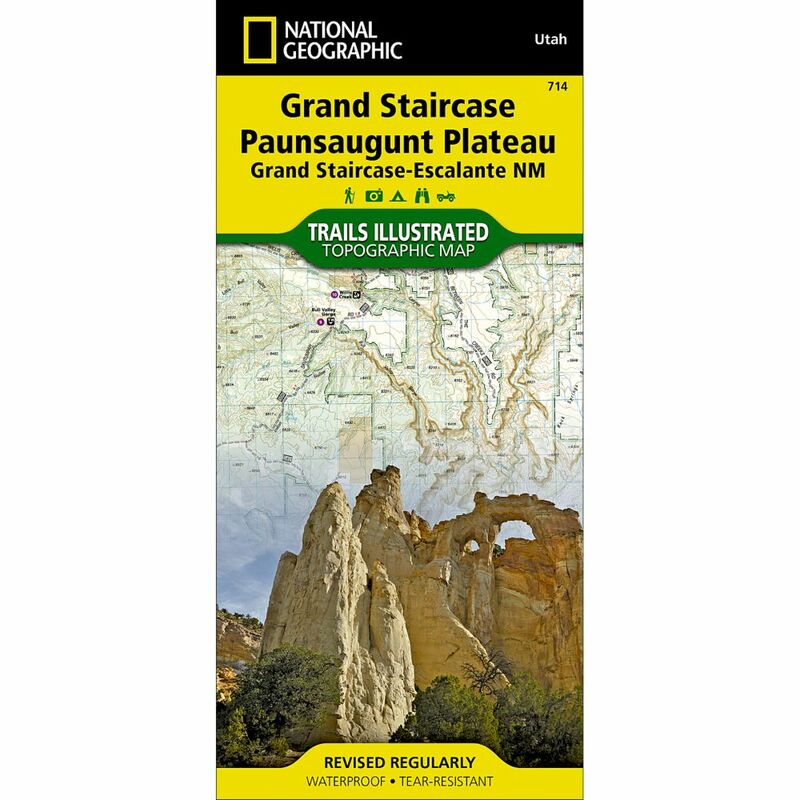 Outdoor enthusiasts seeking to enjoy the abundance of public lands and endless recreational opportunities in southern Utah will marvel at National Geographic’s Trails Illustrated map of Grand Staircase and Paunsaugunt Plateau. Created in cooperation with the Bureau of Land Management, U.S. Forest Service, National Park Service and others, this expertly researched map provides unmatched detail between Utah towns Hatch in the northwest to Big Water in the southeast. Coverage includes popular recreation areas Dixie National Forest, Bryce Canyon National Park, Grand Staircase-Escalante National Monument, Kodachrome Basin State Park and Wilderness Study areas The Blues, Carcass Canyon, Death Ridge, Mud Spring Canyon, Paria-Hackberry, Burning Hills, The Cockscomb and Wahweap. Get off the beaten path and back on again by following along designated hiking, horseback riding, biking and motorized trails, shown with mileage markers between intersections, including the Great Western Trail and Paunsaugunt ATV Trail. Also mapped is a complete road network, including Forest Service, BLM and high-clearance roads as well as state and national scenic byways. Your navigation will be aided by the map's contour lines, elevations, labeled peaks and summits, water features, areas of wooded cover and color-coded boundaries between different land management agencies. Some pinpointed recreation features are campgrounds, primitive campsites, backcountry cabins, RV dump stations, interpretive trails, boat ramps, picnic areas and scenic viewpoints. In addition, find background information about the area, survival tips, a point of interest guide and a QR code for current weather information. Other features found on this map include: Black Butte, Bryce Canyon National Park, Dixie National Forest, Kaiparowits Plateau, Paunsaugunt Plateau, Pink Cliffs, The Cockscomb, White Cliffs.